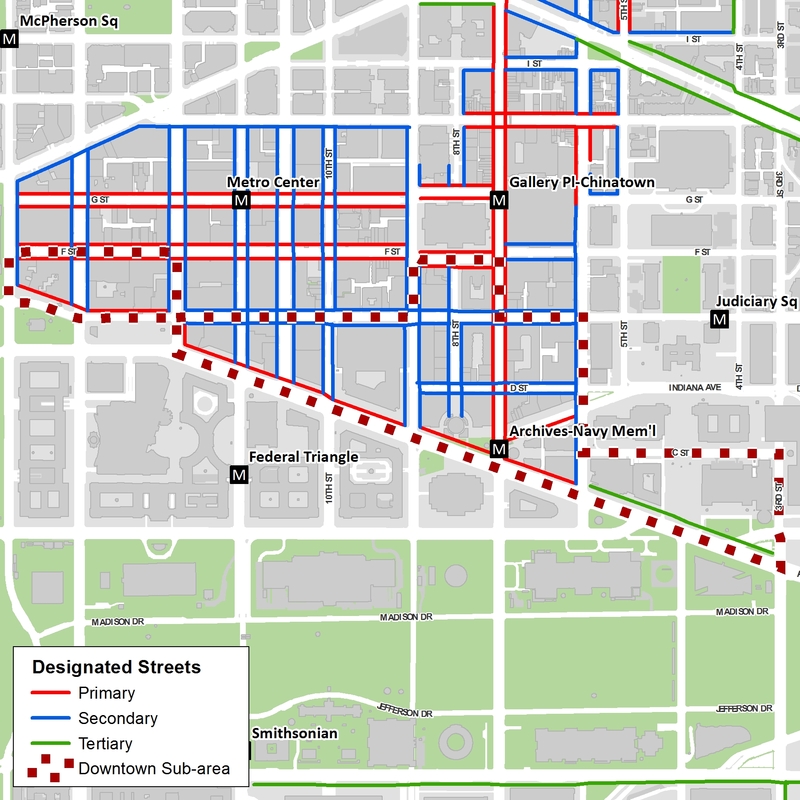 The objectives of the Pennsylvania Avenue Sub-Area are to maintain Pennsylvania Avenue as a mixed-use monumental but lively street with additional height on its north side and active ground floor uses to bridge the downtown with the National Mall and the monumental core. The general location area is the north side of Pennsylvania Avenue, N.W. and between one and three blocks north, between 3rd and 15th Streets, N.W. incorporating the areas, within the boundaries of the Pennsylvania Avenue Development Corporation (PADC) Plan (1974, as amended), including all or parts of squares from 6th through 14th streets, N.W., between Pennsylvania Avenue, N.W. and G Place, N.W. The height of the building or structure fronting on Pennsylvania Avenue shall be measured from the Pennsylvania Avenue curb at the middle of the front of the building or other structure to the highest point of the roof or parapet exclusive of any structure on the roof. A building within the Pennsylvania Avenue sub-area is also governed by the Pennsylvania Avenue Development Corporation (PADC) Plan of 1974, as implemented by the Pennsylvania Avenue Development Corporation General Guidelines and Uniform Standards, 36 C.F.R. §§ 910.1 et seq.